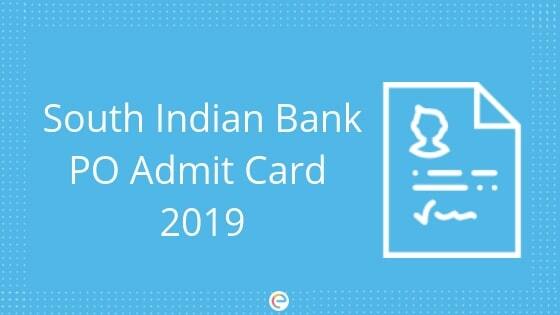 South Indian Bank PO Admit Card 2019: All those candidates who have successfully registered their online application form for Probationary Officer posts can download their South Indian Bank PO Hall Ticket 2019 from its official web portal. The South Indian Bank PO Admit Card got released on 21st December 2018 on the official website of South Indian Bank. Applicants can download their South Indian Bank PO Hall Ticket till 29th December 2018. How to download South Indian Bank PO Admit Card? Step 2: In the homepage click on ‘career section’ provided on the top right-hand side. Step 3: Click on the SIB PO Call letter Download link. Step 4: SIB PO Exam Admit Card Login Page will display on the screen. Step 5: Fill the Registration Number/ Roll Number & password/DOB in the given fields. Step 7: Hall Ticket will display on the screen. Step 8: Download and take print out the SIB Probationary Officer for future reference. Details Mentioned in South Indian Bank PO Admit Card. The initial Shortlisting will be done based on the online test marks and the final selection will be based on the consolidated marks obtained for the online test, GD, and Personal Interview. Bank reserves the right to make required modifications in the selection process considering the number of applications for the post. If the aspirant comes after the reporting time specified on the call letter for Exam, he/she will not be permitted to take the examination. The reporting time mentioned in the call letter is prior to the Start time of the test. Though the duration of the examination is 2 hours, candidates may be required to be at the venue for about 4 hours including the time required for completion of various formalities such as verification and collection of various requisite documents, logging in, giving of instructions etc. We hope this detailed article on South Indian Bank PO Admit Card helps you for the exam. If you have any query regarding the South Indian Bank PO Admit Card or the exam in general, drop a comment below and we will get back to you.